Lost City: The Strangest Building in the East Village—Still Strange, But Looking Great! What an enormous change! Workman are still finishing the restoration. But, as it is, the Strangest Building in the East Village is now also one of the most beautiful. 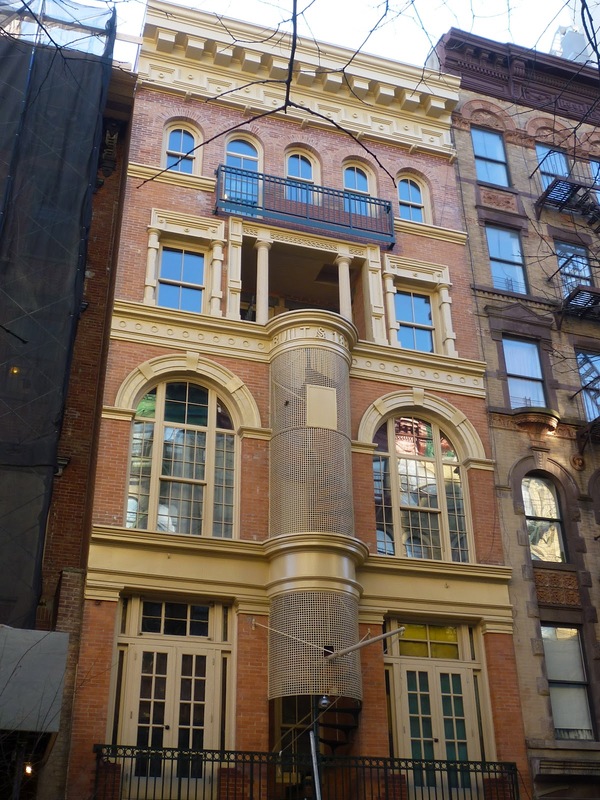 The brickface has been restored, the paint job made uniform, the windows inside the great arched lintels replaced, the windows up top given custom panes that fit their shape, and the rust on the cylindrical fire escape sanded away. The bricked-up window/door on the top floor is now a window again, and the faux balcony that one stood outside it replaced. The loggia looks useable. And I love how clear the message "Built 1889" now is from the street. You can also now see the lettering in the middle: an "M" overlaid with an "S." The initials of the builder, I should guess. The building is now home to Rod Rodgers Dance Company and Studios and Duo Multicultural Arts Center. They received city funds to restore the edifice. They've been trying for more than 20 years to rehabilitate the structure. 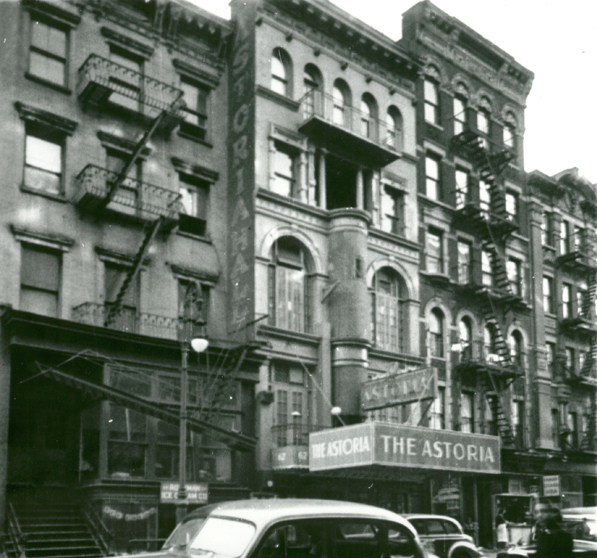 Here's how the building looked back in its days as Astoria Hall. I think it actually looks better now. I walked past this a couple months ago and nearly started crying seeing it returned to its former glory after all these years decaying. Looks simply gorgeous. Would love to hang out on that loggia. With Robert Loggia. ah a shining example of what we love to see. Old New York restored to former glory!! how nice! That's the most impressive renovation I can remember seeing - it looks absolutely stunning! I exhibited black-and-white photographs at the gallery across the street, the Fourth Street Photo Gallery. Rod Rodgers came by a few times while I was there. very nice guy. A couple times when we were desperate for a good, clean bathroom we had to go across the street to his theater. Thanks Rod. Just looking in my files at an old photo I had from the late 70s. So glad to see that NYC's affluence finally got spread around down there and saved the building for art and life!